Janet Laurence’s major international workshop The Elixir Lab is installed at the Inhotim Institute, contemporary art museum and botanical garden in Brumadinho, Minas Gerais, Brazil. 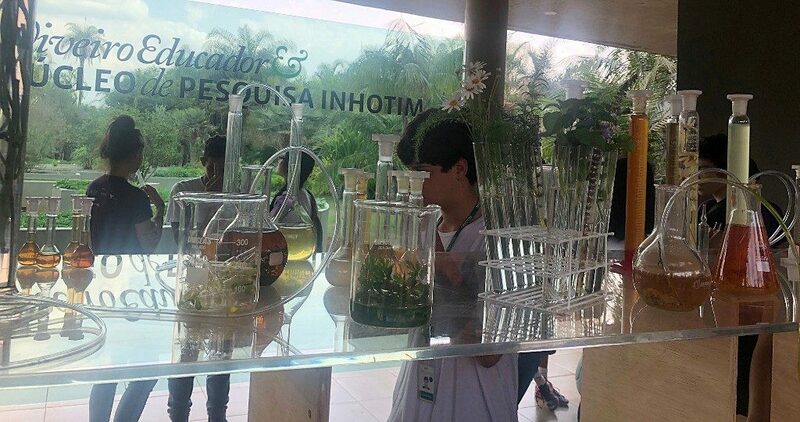 Set in the medicinal gardens at Inhotim, The Elixir Lab is an extreme botanical space and a temporary medicinal lab. Focusing on well-being and sustainability, the workshop offers insight into the often overlooked wonders of the plants around us. The lab serves a range of sample tastings of elixirs infused with various plants, creating an immersive environment crossing science and art. The questions explored within this performative workshop are: Why do plants taste different? What exactly are we tasting? What is it doing to our bodies? What is the plant’s body and where is the evolutionary connection between us and plants? These evolutionary tangles were unravelled in an engaging manner by the artist and a team of performative laboratory assistants.